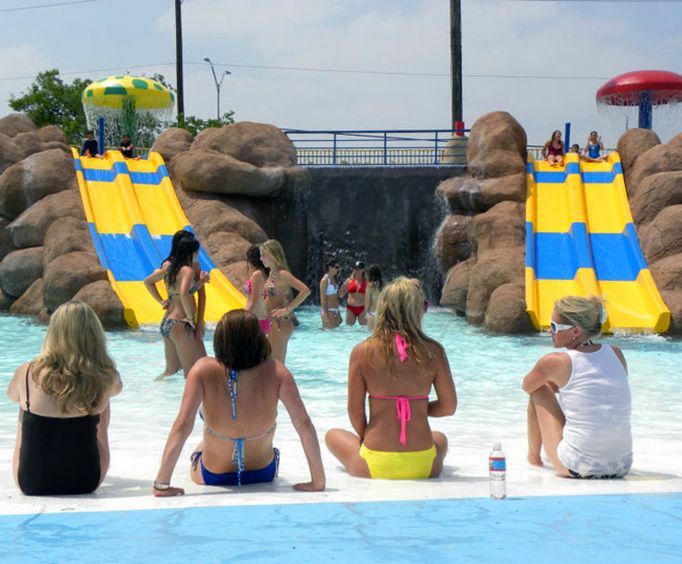 San Antonio Splashtown Water Park offers 20 acres of water fun 50 different rides and attractions and the largest wave pool in southern Texas so you're sure to find something for every member of the family! Staying dry at Splash Town Water Park just isn't an option! With a special area for guests under 48', every member of the family can enjoy all Splashtown San Antonio rides have to offer. Frolic in the Wild Wave Pool or relax in the Paradise River. Try the seven-story high Brain Drain or ride in the ultimate storm, Tornado for a thrill ride you'll be sure to remember! Splashtown Water Park offers concession stands, free parking, and affordable locker rentals that will assure a full day of fun for the whole family! Not only is Splashtown a park full of water-based fun, but it also provides sand volleyball courts and full-sized basketball courts. So work up a sweat at the courts, then head back to the water rides for a nice cool down! There are plenty of rides the whole family can enjoy together at Splashtown Texas. Big Kahuna: This mega-tube raft ride will excite every member of the family. Experience total darkness in an enclosed tunnel taking unexpected twists, turns, drops, and curves. After the tummy-turning twists in the dark tunnel, your five-person raft will drop into the catch pool! Paradise River: Take a break from the thrill-rides, grab a tube, and sit back and relax along the Splashtown lazy river. Runaway Rapids: Another enclosed slide, this ride has three flumes offering a different ride each time down! Stingray Racer: This six-lane racing slide is the longest and largest of the park. Overcome bumps and dips as you slip 'n' slide down this ride. Thunder Run: This family-fun tub ride allows for all sorts of twists and turns! Wild Wave Pool: Over 1/2 million gallons of water in the Wild Wave Pool is sure to leave you with pruny fingers! Zoom Flumes: Pair up and slide down this 95-foot semi-enclosed tube slide. San Antonio Splash Town Water Park has designated this area for younger kids. Incredible Kid's Kove has plenty of smaller-scale rides, slides, and other attractions. 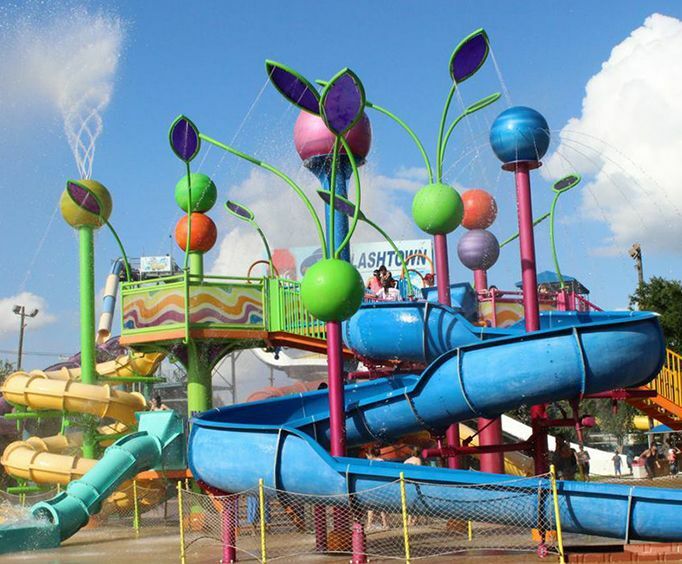 Wet 'N' Wild Jr&period;: Even little adventure-seekers can experience the joys of Splash Town Park with eight different water slides, a spray tower, a waterfall, and jumping spray fountains. Tree House: There are no limits when it comes to this three-story-high good time. But watch out for the 1000 gallon bucket; you never know when you might get caught underneath! Blue Lagoon Activity Pool: There is no shortage of water in this lagoon. Bring the whole family for a fountain of opportunities at the Blue Lagoon Activity Pool in the heart of Splashtown Water Park! The bigger, faster, scarier rides can be found at all corners of the park. Below are some favorite Splashtown rides of fellow thrill-seekers! Big Spin: This funnel-shaped water slide is sure to leave you soaked! Spin 'round and down this Splashtown favorite. Brain Drain: This seven-story-high ride is a twisting, twirling slide that will leave you with unrelenting excitement. FlowRider: Anyone adventurous enough can catch some rad waves on this wave simulating ride. Bring a competitor because this ride is a double, meaning more than one person can ride at a time! Ripqurl: Head up to the top through a dark tunnel before you're launched forward up to 26 feet per second into the 40-foot bowl and left in the pool below! Starflight: This Splashtown favorite is a double tube that will send you on a thrill ride through total darkness. There's even a Jr&period; Starflight for those dare-devilish youngsters! Texas Free Fall: If you like heights, this ride is for you! Climb five stories and free fall down this water slide! Tornado: Feeling daring? Take a ride on the ultimate storm where you'll begin 75 feet in the air before falling down a 132-foot long tunnel and end up into a giant funnel of 5,000 gallons of water! Wala Wala Falls: What goes up must come down on these 30-foot long slides! Bring a friend and see who can reach the bottom of these slides first! Ocean Breeze Cafe: Enjoy a juicy hamburger or hotdog platter, share a pizza, or eat healthy with a variety of salads and wraps or a grilled chicken platter. Paradise Grill: Indulge in a loaded baked potato or go all out with the single meat platter. Funnel Cake: You can't visit a theme park and not enjoy a funnel cake! Try Splashtown's Strawberry and Cream funnel cake or settle for a traditional powdered funnel cake. Sweet Shop: Satisfy your sweet tooth at the Sweet Shop located at the front gate with fresh fudge, cookies, popcorn, or ice cream. Surfside Grill: After you enjoy a relaxing ride on the Paradise River, check out the Surfside Grill for burgers, hot dogs, or chicken tenders. Sharky's Bar: Been a long day and need a drink? Grab an alcoholic drink or some chips and queso at Sharky's. Dippin' Dots: This park favorite will satisfy your sweet tooth and cool you off during a quick, out-of-the-water break. Icee Mix-It Up: Quench your thirst at the Icee station next to the Wave Pool. Fajita Tent: Spice up your visit with a trip to the Fajita Tent. Try the walking taco for an on-the-go tummy-filler or sit down and enjoy fajita tacos, fajita nachos, sausage on a stick, or carnita tacos. 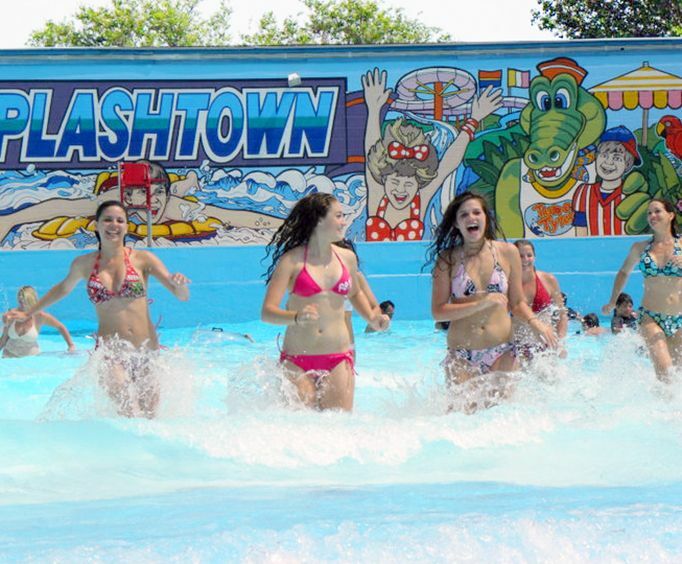 A trip to Splashtown will fill your day with splashing fun for all ages. A waterpark is a fantastic way to soak up the San Antonio sunshine and enjoy some awesome adventures in the area! What is included in the Splashtown Waterpark admission price? This includes full day admission to Splashtown. Are wheelchairs and strollers available at Splashtown Waterpark? No. Guests must bring their own. What on-site amenities are available? Swimwear. Children under 2 must wear a swim diaper. Are lockers available at Splashtown Waterpark? If so, is there a fee? Yes. There is a rental fee. $8 with $2 deposit. Are tubes available at Splashtown Waterpark? If so, is there a fee? How large is Splashtown Waterpark? There are more than 50 rides and attractions. Is smoking allowed inside Splashtown Waterpark? Only at the designated smoking area near the Serpentines and Big Red Pavilion. "were having such an excellent time we ended up leaving at closing time"
Last year was the flirts time my 5 year old and i visited splash town, we went in at exactly opening time i expected we would leave in a couple hours, my son and i were having such an excellent time we ended up leaving at closing time. We are now planning a trip for this year except this year i am taking my two year old and my husband. We loved all the rides and all the life guards are at their best and always keeping an eye on all the visitors. God bless you all. See you this year. "We stayed for about 4 hours and had a blast. The kids wanted to go again!" We loved splashtown, while not as big as the other one - it did the job. We stayed for about 4 hours and had a blast. The kids wanted to go again! "Love the fact that you don't have to walk miles and miles to get to a ride." Love the fact that you don't have to walk miles and miles to get to a ride. We're in our fifties, but we still enjoy doing all type of activities and this place is great for the young and old... Watch for ticket specials that can't be beat anywhere else. Schliterbahn is just up the road 18miles from our house, but it is way too large to really enjoy, lines our very long and park is really for young adults because of walk distances between rides. Small enough to keep an eye on all 3 boys at the same time. And big enough that they loved it.